In a period of ‘not’ more than a year from now, Rwanda’s carrier RwandAir will have started direct flights to Italy. The government through the Ministry of Infrastructure signed Bilateral Air Service Agreement with the Italian Republic for the purpose of establishing and operating air services between and beyond both countries. According to Infrastructure Ministry which signed the agreement today, August 20, in respect of its international air services, the Bilateral Air Service Agreement signed between Rwanda and Italy grants to both parties the rights to fly across its territory without landing, as well as making stops for non-traffic purposes. For non-traffic purposes, it means that RwandAir can land on Italian airport for fuel, maintenance or other technical reasons, but cannot take on or discharge passengers, cargo or mail. In other words, such landings are also called ‘technical stops’. According to Makolo, Rwanda has finalized all requirements and awaits Italian Republic to work on its side. When the new air service agreement comes into force, it means that RwandAir, which was awarded “second best exhibitor” in the 21st Rwanda International Trade Fair (RITF) known as Expo, would start enjoying Italians skies as it adds more routes across Europe, Asia and America. On August 10, RwandAir announced its passenger number will hit 1,151,300 from 926,571 in June 2018 during 2018/2019 fiscal year. The national carrier also said the positive shift in the number will be pushed by its new destinations which will increase from 26 to 31. The new destinations include Addis Ababa Gguangzhou, TelAviv; Guinea and New York. 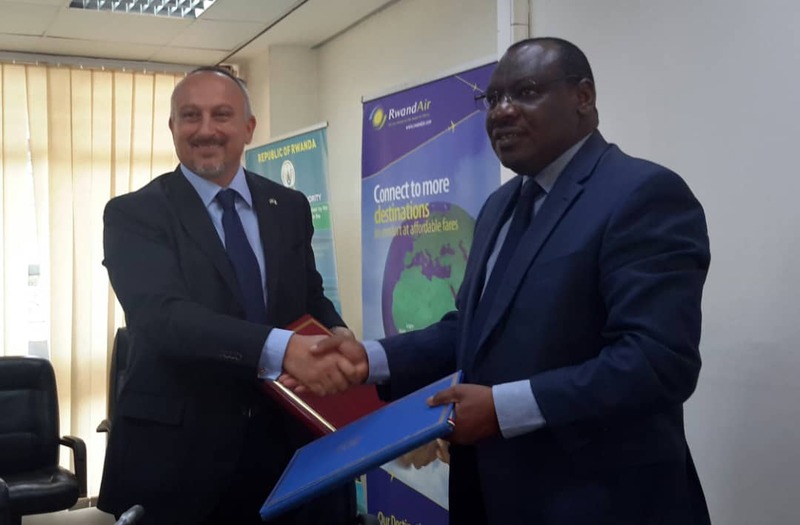 Meanwhile, Infrastructure Minister Claver Gatete who signed the agreement together with Italian ambassador to Rwanda Domenico Fornara, said the agreement which allows RwandAir to land on any Italian airport is “a boost to Rwanda’s trade overseas”. For Ambassador Fornara, the agreement will allow European tourists to easily visit Rwanda and the region.